Not sure what the top ones are, but they grow well! Fuschias - I love them! 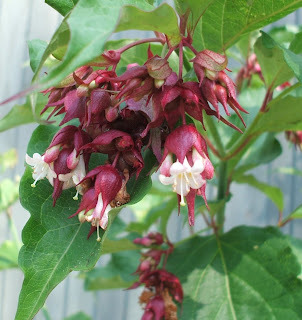 I know these as pheasant berries, but having googled I discover they're Leycesteria formosa. They've self-seeded everywhere, so gorgeous though they are, some are going to have to go. My apologies to all local pheasants. Top ones are crocosmia, the common orange one grows well all over, you can get a bright red one called 'Lucifer' too. I like the fushias, I use to pop the buds when I was a child visiting my nan's garden! Thanks Lyn, I thought they looked like a type of crocus - and they certainly do grow all over. I love the contrast of them against the dark blue/green leaves of my hostas. 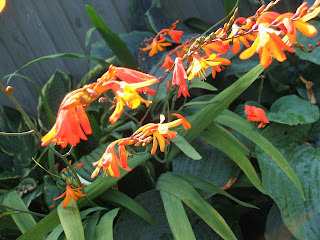 Ah, so they're crocosmia - another thanks to Lyn!! We have them all over too and they are really lovely, great vibrant colour and contrast. Heather, your garden is lovely! 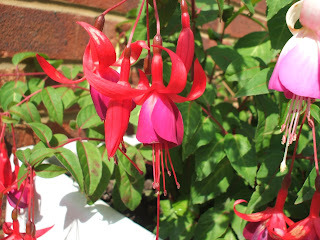 Fuschia is a favorite of mine...I used to love to pop the blossoms before they opened when I was a little girl too.